Cavan 1-7 Mayo 4-6 (Kingscourt, 12/2/1961). MAYO: V Robinson; A Swords, S O’Reilly, J Fleming; E Walsh, J Farragher, R Clarke; B McLoughlin, W Shannon; S Rowe (2-0), M Ruane (1-0), F O’Leary (0-3); M Kennedy (0-1), T Rochford (0-1), T O’Boyle (1-1). Mayo 1-10 Westmeath 2-6 (MacHale Park, 5/3/1961). MAYO: J Foye; S Hunt, S O’Reilly, J Fleming; A Swords, J Farragher, R Clarke; W Shannon (1-0), B McLoughlin (0-1); S Rowe (0-1), M Ruane, F O’Leary (0-2); M Kennedy (0-3), T Rochford (0-1), T O’Boyle (0-2). Leitrim 0-6 Mayo 1-7 (Mohill, 26/3/1961). MAYO: J Foye; S Hunt, S O’Reilly, B Keane; A Swords, J Farragher, R Clarke; B McLoughlin, W Shannon; T Treacy (0-1), M Ruane (0-2), S Rowe (0-1); M Kennedy (0-2), T Rochford (0-1), T O’Boyle (1-0). NFL SEMI-FINAL: Derry 0-11 Mayo 1-7 (Croke Park, 16/4/1961). MAYO: J Foye; S Hunt, S O’Reilly, B Keane; E Walsh, J Farragher, R Clarke; W Shannon, B McLoughlin (1-0, a ‘50’); T Treacy (0-1), M Ruane (0-1), F O’Leary (0-1); M Kennedy (0-1), T Rochford (0-1), S Rowe (0-2). FIRST ROUND: Galway 0-10 Mayo 0-6 (Tuam Stadium, 11/6/1961). MAYO: J Foye; S Hunt, S O’Reilly, B Keane; E Walsh, J Farragher, R Clarke; B McLoughlin, T Rochford; S Rowe, F O’Leary (0-1), M Ruane (0-2); T Treacy (0-1), M Kennedy, T O’Boyle (0-1). Sub: J Langan (0-1). Sligo 1-3 Mayo 3-5 (Markievicz Park, 22/10/1961). MAYO: J Foye; W Casey, S O’Reilly, S Hunt; C Hanley, J Farragher, V Nally; J Morley, PJ Loftus (0-1); S Rowe, F O’Leary (0-1), J Madden (0-1); M Kennedy, M Ruane (2-2), E Walsh (1-0). Mayo 1-5 Longford 1-7 (Claremorris, 5/11/1961). MAYO: J Foye; W Casey, S O’Reilly, S Hunt; V Nally, J Farragher, B Keane; T Rochford, PJ Loftus; S Rowe,F O’Leary, E Melvin (1-1); M Kennedy (0-2), M Ruane (0-1), E Walsh (0-1). Cavan 0-8 Mayo 3-5 (Breffni Park, 12/11/1961). MAYO: J Foye; W Casey, B Keane, S Hunt; T Rochford, J Farragher, V Nally; PJ Loftus, B McLoughlin (0-1); F Costello, F O’Leary (0-3, two frees), E Melvin; S Rowe (1-0), M Ruane (2-1), E Walsh. Subs: W Corcoran for Loftus, J Morley for Costello. Mayo 1-2 Westmeath 3-10 (Fr O’Hara Park, Charlestown, 19/11/1961). MAYO: J Foye; S Hunt, B Keane, S O’Reilly; T Rochford, W Casey, V Nally; T Hynes, B McLoughlin; S Rowe, F O’Leary (0-2), E Melvin; M Kennedy, M Ruane (1-0), E Walsh. Subs: J Madden for Hynes, P Griffin for Madden. PRELIMINARY ROUND: Mayo 1-14 Galway 2-8 (MacHale Park, 9/7/1961). MAYO: H O’Brien; C Hanley, V Nally, B Reape; S Murphy, E Carroll, G Nicholson; J Madden, J Langan (0-1); D McSweeney (1-0), M Connaughton (0-4), PJ McLoughlin (0-1); J Nealon, D Bruen (0-4), J Warde (0-4). Sub: V O’Reilly for Langan. SEMI-FINAL: Mayo 2-11 Leitrim 1-3 (St Coman’s Park, Roscommon, 23/7/1961). 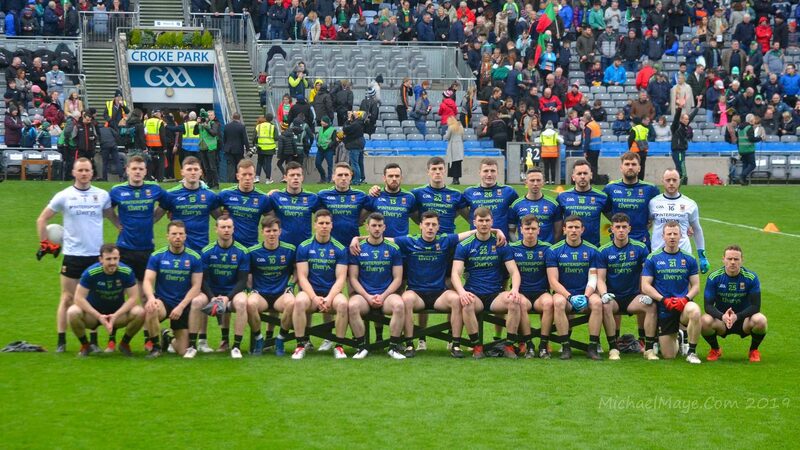 MAYO: H O’Brien; C Hanley, V Nally, B Reape; S Murphy, E Carroll, G Nicholson; J Madden (0-1), J Langan; D McSweeney, M Connaughton (0-2), PJ McLoughlin; J Nealon (1-0), D Bruen (0-2), J Warde (1-4). Subs: M O’Malley (0-2) for McLoughlin, P Fahy for Bruen. FINAL: Mayo 5-8 Sligo 0-5 (James Stephens Park, Ballina, 30/7/1961). MAYO: H O’Brien; C Hanley, V Nally, B Reape; S Murphy, E Carroll, G Nicholson; J Madden, J Langan; D McSweeney (1-2), M Connaughton (0-1), PJ McLoughlin; J Nealon (3-1), D Bruen (1-2), J Warde (0-2). SEMI-FINAL: Mayo 1-10 Dublin 2-6 (Croke Park, 20/8/1961). MAYO: H O’Brien; C Hanley, V Nally, B Reape; S Murphy, E Carroll, G Nicholson; J Madden, J Langan (0-2); D McSweeney (0-3), M Connaughton (0-1), PJ McLoughlin (0-2); J Nealon, E Maguire (1-1), J Warde (0-1). FINAL: Cork 3-7 Mayo 0-5 (Croke Park, 24/9/1961). MAYO: H O’Brien; C Hanley, V Nally, B Reape; S Murphy, E Carroll, G Nicholson; J Langan, J Madden (0-2); D McSweeney, M Connaughton (0-1), PJ McLoughlin; J Nealon (0-1), E Maguire, J Warde (0-1). Subs: D Carroll for Nicholson, Nicholson for Carroll, M O’Malley for McSweeney.